An Iranian oil official said the country is ready to help restore balance to the oil market but did not hold out much hope given that some producers are pumping crude at record levels. “Naturally, if a country wants to produce at full capacity, there will be no balance in the market,” Deputy Petroleum Minister for Trade and International Affairs Amir Hossein Zamaninia said late Saturday. The official did not name a country, but his comments were apparently directed at Saudi Arabia which recently backed out of an agreement with Russia and other countries to freeze crude production. Riyadh has been insisting that all countries join the freeze initiative, singling out Iran which has been ramping up production to redeem its lost market share after the lifting of Western sanctions. He said OPEC countries need to find a way to revive the quota system which Saudi Arabia scuppered in December 2011 and introduced an output ceiling of 30 million barrels per day (bpd). 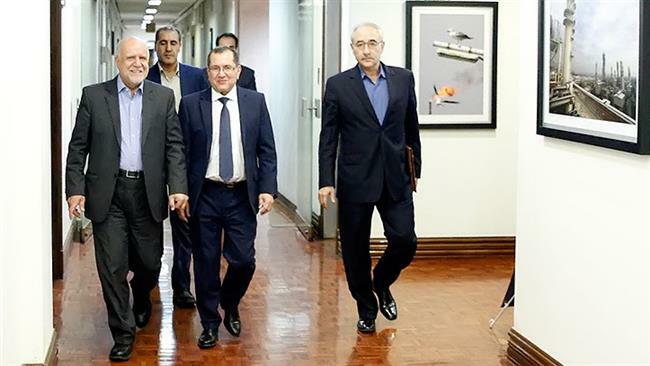 His remarks to reporters came after Algerian Energy Minister Nouredine Bouterfa met with Iran’s Minister of Petroleum Bijan Zanganeh in Tehran. Bouterfa has travelled to Iran ahead of an OPEC meeting on the sidelines of the International Energy Forum (IEF), which groups producers and consumers, in Algeria on Sept. 26-28. Zamaninia said 90% of Algeria’s budget depends on oil and gas revenues, but that lower prices have extremely put the North African country’s finances under strain. He said Bouterfa had made some proposals to strike a balance in the oil market in order to prop up prices in a reasonable way. “OPEC members are trying to reach a price of $50 to $60 per barrel and we have made a request for reaching consensus on a price and coordination among OPEC members in this regard,” Bouterfa said. Bouterfa said Iran’s participation in the next meeting was important even as he did not say whether the Islamic Republic would accept other members’ views about production and prices. “This depends on Iran’s view. How much consensus would be there, I cannot answer this question and you must ask this from Iranian officials,” he told reporters. On Friday, Russian President Vladimir Putin was quoted as saying that a potential oil output freeze deal among oil-exporting countries should involve some compromise on Iran’s production levels. “I think that from the point of view of economic expediency and logic, it would be right to find some sort of compromise” on the Iranian output level, Putin told Bloomberg. He said countries now recognize that Iran should be allowed to continue raising production as sanctions have been lifted against the country. Global oil prices have seen a fall from a high of 147 dollars a barrel to a low of around 25 dollars in recent years. Putin held Saudi Arabia responsible for failed attempts by OPEC and non-OPEC oil exporters to reach a pact on stabilizing production levels. “It wasn’t us who rejected a freeze on production volumes, it was our Saudi partners who at the last minute changed their point of view and decided to take a time out in taking this decision,” Putin said, referring to a deal reached in Qatar in April.